Ganesha, the elephant deity, is one of the most beloved and recognizable figures in the Hindu and Buddhist pantheon. 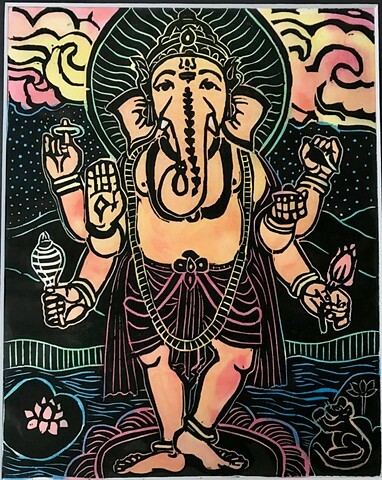 Ganesha is widely revered as the remover of obstacles, the patron of the arts and sciences and the deva of intellect and wisdom. He is invoked for auspicious beginnings, at the start of travel, marriage and new adventures. His vehicle is the mouse, moushika, symbolizing Ganeshas’ ability to travel anywhere to assist, even the smallest places. This is #6 in a series of mini Ganeshas. Mokuhanga is the traditional Japanese style of woodblock prints. Typically a separate block is hand carved for each color used. The blocks are printed onto Japanese Kozo or mulberry paper by hand rubbing with a barren. The inks used are sumie and watercolor inks. Mokuhanga is a labor-intensive old school printmaking practice. Small mokuhanga woodblocks are very difficult to carve.